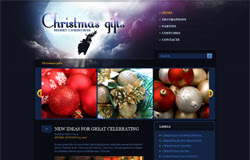 2 Columns, Right Sidebar, Christmas, Portfolio, Featured Video Slider, Fixed Width, Dark Background. "#" with your featured post URL. "slide,jpg" with your slider image URL.